Tickets are available here. Visitors will receive special glassware for the event and unlimited access to the beers until they run out. Baere - This table sour brings herbal characteristics from juniper berries gathered from Meeker, CO to complement its tart base. Black Project - MICROB inspired by the hunt to find new and exciting yeast, this beer features more than 40 wild yeast strains collected by the Fermentologists and fermented in a Syrah barrel. Bonfire - Rose Hip Hoppy Wheat incorporates rose hips near the end of the boil. 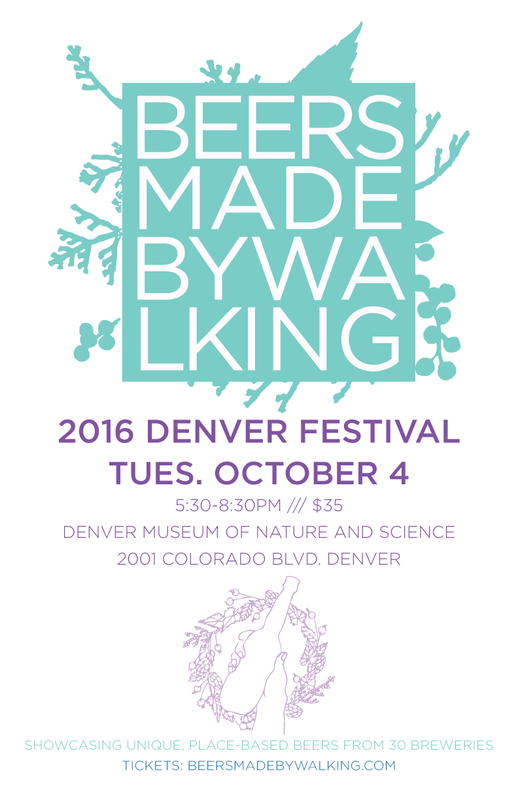 This beer takes inspiration from a walk with the Walking Mountains Science Museum in Avon, CO.
Cerebral - Oat Saison with Bee Pollen, Lemon Zest and Elderflower. Inspired by a walk around the Denver Zoo, near the brewery. Crazy Mountain - Naughty Pine, a pale ale that includes a big addition of 25 pounds of pine needles in place of finishing hops and was aged in Breckenridge Bourbon barrels for 9 months. Inspired by a hike along West Lake Creek Road in Edwards, CO.
Crooked Stave - Wild Mint Imperial Coffee Stout Inspired by hiking and fishing in the Gunnison Canyon. This imperial stout incorporates fresh mint sprigs added during the conditioning process in addition to spending some time on coffee. Dry Dock - Highline Plum Saison Brett inspired by plums that grow wild along Denver’s Highline Canal. This mixed culture saison boasts a tart and jammy native plum addition. Fiction - Twilight Superstition inspired by spending some time walking through a pumpkin patch located on a farm in Byers, CO. This beer is a brown kettle sour base with over 100 pounds of pumpkin and spice added. Fieldhouse - Tart Cherry Stout Stirred by cherry trees that grow just east of Colorado Springs, this stout incorporates a native Colorado fruit. Goldspot + The Grateful Gnome - Honey Stout with Lavender is a “dry-lavendered” honey stout. This collaboration beer features an herb that grows throughout Colorado in addition to the short walk between the two breweries. Great Divide - The Herbivorous One is inspired by a walk in Bluff Lake Nature Center Museum of Nature and Science as well as camping at Gross Reservoir. This unfiltered IPA includes some flaked quinoa in the mash as well as juniper berries in the whirlpool and dry-hop. Horse & Dragon - Perambulation Ale 2016 - A beautiful golden ale brewed with red sumac. Living the Dream - Black Currant Saison incorporates dark fruit flavors from plants growing wild in Colorado. Odd 13 + Our Mutual Friend - Dragon Chaser is a collaborative effort in nature. This blended sour was aged on 500 pounds of peaches, creating an intensely juicy and tart offering. Paradox - Sahti. A Finnish specialty small batch beer incorporating a mix of unique grains as well juniper berries. Ratio - Plum Saison inspired by a walk around owner Jason zumBrunnen’s neighborhood. This saison incorporates two varieties of plums: one native as well as a sour and salty variety called Umeboshi. Spangalang - Colorado Junction inspired by a walk with friends at Ela Farms through their orchards, this beer is 100% fermented with Brettanomyces, dry hopped with Colorado Chinook hops and finished with 200 lbs. of Ela Palisade peaches. Stem Cider - Blueberry Spiced Malice is a firkin of Malice dry-cider with blueberry preserves and local spices (cinnamon, nutmeg and clove). A collaboration with Modern Gingham. Strange Craft Beer - Plum Rosie Blonde inspired by a hike along Coal Creek, this Belgian Blonde features additions of Colorado plums and rose hips. Trinity - Menacing Apple is crafted in the spirit of wild harvest. Featuring a feral brettanomyces strain and aged on Palisade apples. TRVE - Foeder Fermented Saison with Herbs inspired by a walk with the Museum of Nature and Science in Bluff Lake Nature Center and the English beer style called Mumm. This saison fermented in foeders was dry-hopped with chamomile, elderflower, bergamot, dandelion and sage. Upslope - Saison with Orange Blossom Honey and Douglas Fir Needles crafted after following a hike around the Third Flatiron in Boulder. Wild Woods - Rose Family Blonde inspired by the the whole family of the roses that grow wild in Boulder. This one's a blonde ale featuring rose hips, rose petals, hawthorne berries and raspberry leaves. Burial (NC) - Triumph of Death Saison featuring foraged sumac from the Appalachian hillsides with lemon peel, honey as well as a backbone of locally malted Pilsner and Rye from Riverbend Malting. Fonta Flora (NC) - Carolina Custard is an Appalachian Wild Ale featuring paw paw fruit- a fleshy, tropical fruit native to North Carolina. Hopworks (OR)- A golden beer featuring locally sourced malted barley with Scotch Broom and Dandelion invasives that were collected in the Mt. Hood Region. Scratch (IL) - Barrel Aged Black Cherry is a black sour ale brewed with cherry bark and aged in a Norton wine barrel from a local winery.